Hey quilting kittens! I've just finished free motion quilting my first project. It is definitely student work, but I am proud of it. When I went to square up the quilt for binding, I found that I had quilted too close to the edge and I cut through some of the lines of stippling. When I sew on the binding will those areas be secured, or do I need to do something to secure those lines before I bind it? No you should be good to go. When you sew on the binding you will secure those lines of quilting. Thanks! That's what I thought, but wanted to be sure. Yep, you should be ok. I finished and sent this to my brother for Christmas. I took several pictures and the quilting didn't show up well in any of them. But here is a close up of the wibbily-wobbly spirals and the pebbles in the window panes. There's lots of room for improvement, but I am very pleased. That's fantastic! Well done, @wireknitter! No doubt your brother will love it. That is fantastic @wireknitter. Is that your own design? 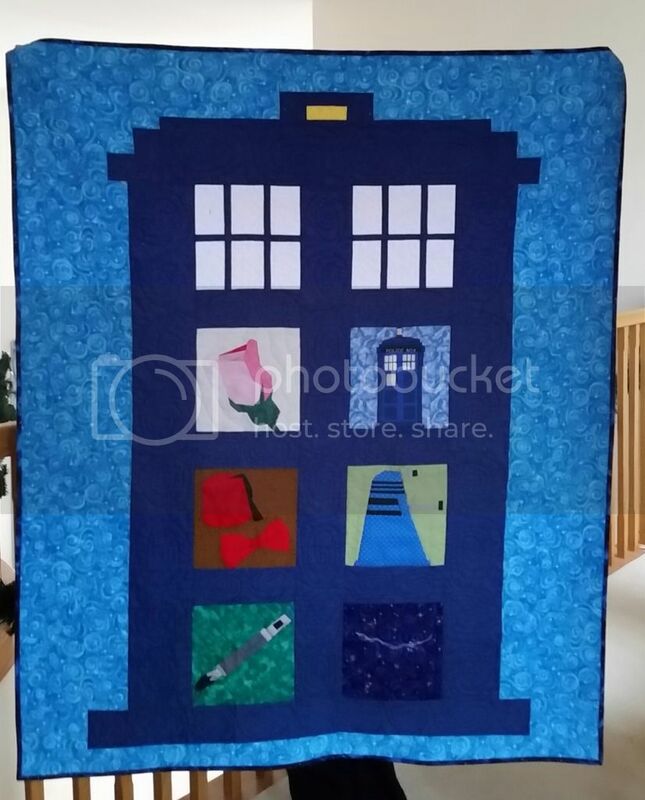 I do love the actual quilting as well as the images. Thanks everyone! @GraziDiMenti The images come from patterns at fandominstitches.com. Those paper piece patterns are what really got me quilting. I had pieced three traditional quilt tops and was really doing it to help a church group; it was a nice hobby but not really an obsession. Then I stumbled upon this and had to see if I could do it. 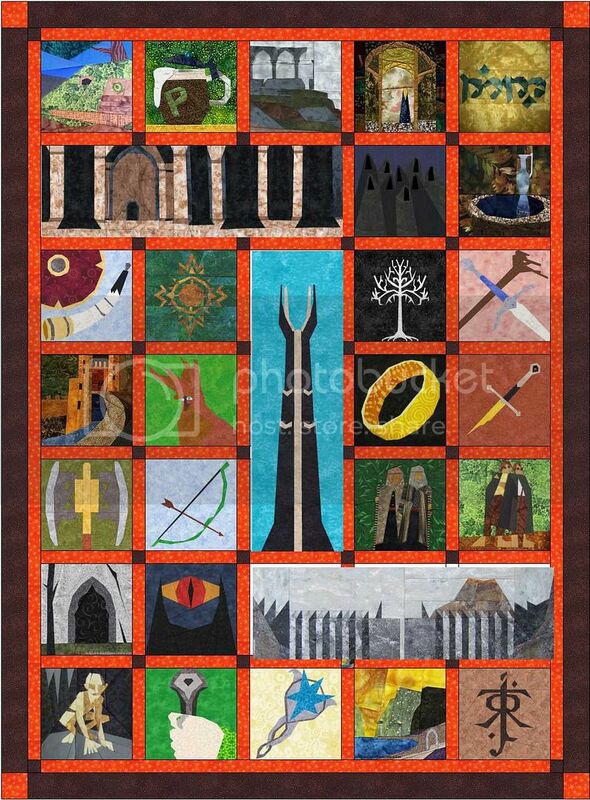 I just made a small number of the LOTR blocks but it was such fun making the images that I have been doing it ever since. I made a Dr. Seuss quilt and had it professionally quilted, but realized that after I had spent so much time doing the images, turning it over to someone else was hard. That's when I decided to learn FMQ. Very clever design @wireknitter. 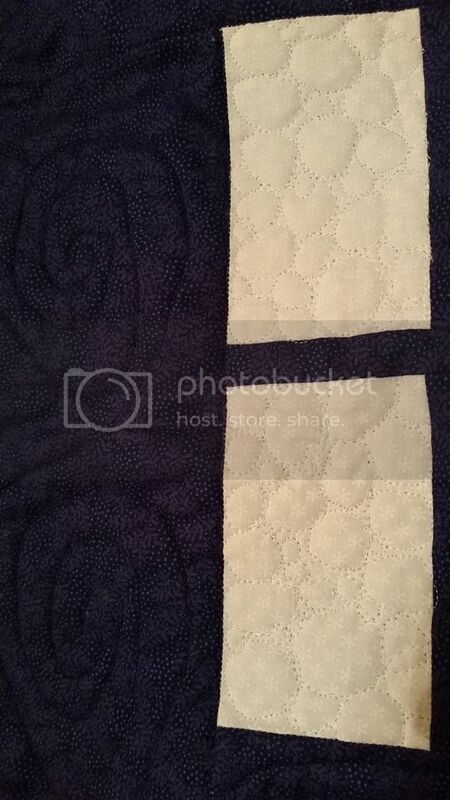 Looks like a great job on the free motion quilting. I've never tried it myself, I'm so old school, that up to now everything I've quilted has been done by hand (I machine piece though).